Are you an ACT Fibernet user? If yes, this post is for you. Here I have shared Freecharge offers on ACT Fibernet bill payment for both new and user of Freecharge. From this guide, you can get the instant cashback to your Freecharge account & save your money. 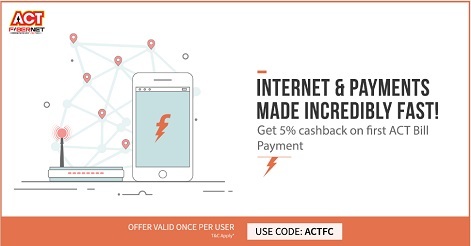 Make your online ACT Fibernet bill payment with Freecharge to get the 5% cashback on your ACT Broadband bill amount. To get this ACT Fibernet bill payment offers just follow the below steps. 1. Open the Freecharge portal and log in your account. 2. Click 'Broadband' tab on the left side of the page and select ACT Fibernet option in the drop-down menu. 4. Complete your payment by choosing your preferred payment option like Credit Card / Debit Card, Net Banking, or Freecharge Wallet. 5. After successful bill payment, the cashback amount will be credited in minute (Maximum time:24 hours) to your Freecharge Wallet. Valid on First ACT Bill payment through Freecharge. Max cashback amount of Rs 50. Valid only once per User/CC/DC/FC Account. Now Freecharge is offering Rs.100 cashback on your first time ACT Fibernet bill payment online. This ACT bill payment offer is available only on Freecharge mobile app. To get this offer just follow the below mentioned steps. 1. Download the Freecharge App from the Google Play Store. 2. Create an account with Freecharge by the click of Register button. 3. After the mobile number verification, click the ACT Fibernet login & open your account. 4. Select 'Broadband' tab on the left sidebar, and choose ACT Fibernet from the list. 6. Pay through your preferred payment method from Credit Card / Debit Card, Net Banking, or Wallet. 7. You will receive the cashback amount in a Minute (Maximum time 24 hours). Enjoy!!! Note: If you already used a first-time bill payment offer try with some other mobile number and mail id. If you have any queries and suggestion or updates just feel free to share with us through the comment section given below.